“Induced demand” is the idea that building and widening roads doesn’t make traffic better–it makes it worse. Late last year Caltrans finally acknowledged that, yeah, it’s probably true that all the work they’ve been doing for the past few decades has been for naught. Not everyone got the memo. The Valley Transportation Authority (VTA)’s proposed half-cent sales tax, which is supposed to fund everything from buses to Caltrain to bicycle routes, could also open the floodgates to billions of dollars in continued highway expansion. That’s because Palo Alto, Mountain View, Sunnyvale, Los Altos, Los Altos Hills, Cupertino, Campbell, Saratoga, Los Gatos, and Monte Sereno have included a total of $1.5 billion in auto traffic capacity expansion projects in their draft proposals on where to spend the money [PDF]. That means $1 billion will go to county expressways and another $500 million on state highways and local arterial roadways. San Jose’s funding priorities [PDF] include $650 million countywide for reconstructed highway interchanges “to support economic development,” including $320 million for six expanded interchanges. Even more money could be sunk into traffic capacity expansions on city streets via a “local streets and roads” category intended for repaving but which also can include lane additions and signal modifications. The North County and West Valley cities have proposed $1 billion for local streets and roads, while San Jose has proposed $1.8 billion. In other words, more and more asphalt. But Khamis’s belief is out of sync with state policy to abandon Levels of Service, the flawed notion that managing traffic is about moving cars rather than people. Anyone who’s come down to Los Angeles and tried out the newly widened 405 knows all about the “joys” of driving on a wider expressway. Then again, the insistence by city leaders on more asphalt could end up bringing down the whole proposal, which requires a two-thirds majority to pass the November ballot. “The Sierra Club opposes additional freeway or expressway lanes and is not likely to support this tax if it contains this sort of expansion,” said Sierra Club Loma Prieta Chapter Executive Committee member Shani Kleinhaus. Kleinhaus noted that the environmental review of the county’s Expressway Plan 2040 did not include Traffic Demand Management programs as a feasible mitigation measure, a violation of the California Environmental Quality Act (CEQA). 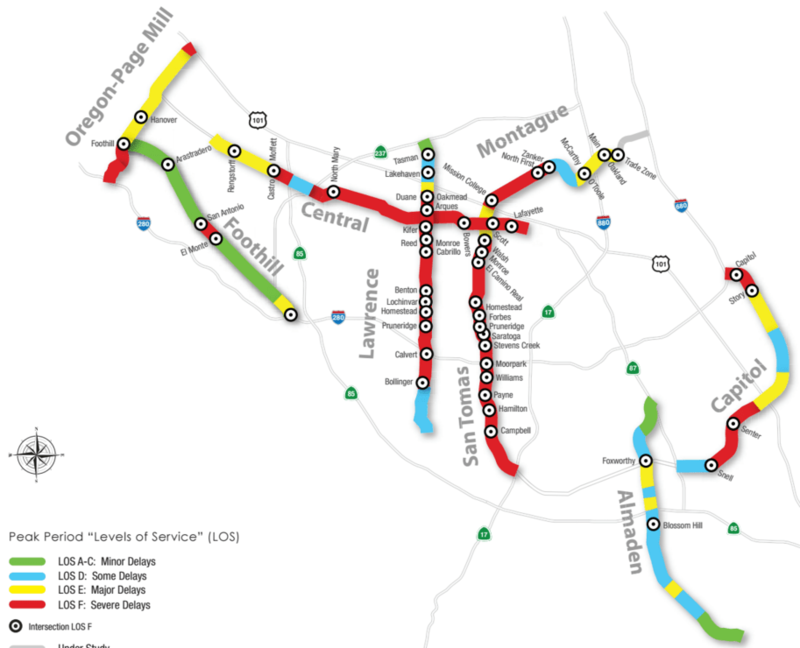 The VTA sales tax, if passed, would help pay for major transit upgrades as well. San Jose is calling for $1.5 billion for four-station, $4.3 billion extension of BART from Berryessa to Santa Clara. The North County cities are proposing a more modest $1.2 billion for the extension. The project includes $800 million to connect the San Jose Diridon Caltrain Station with the Santa Clara Caltrain Station, a segment already served by Caltrain with plenty of excess rider capacity. How much to spend on BART and Caltrain is a major point of contention between San Jose and other cities in the county. The new sales tax would generate an estimated $6 billion for major transportation projects over the next 30 years. That would be a nice bit of cash for transit, walking and cycling infrastructure. Let’s just hope South Bay officials can kick the asphalt habit before the plan gets much further along. 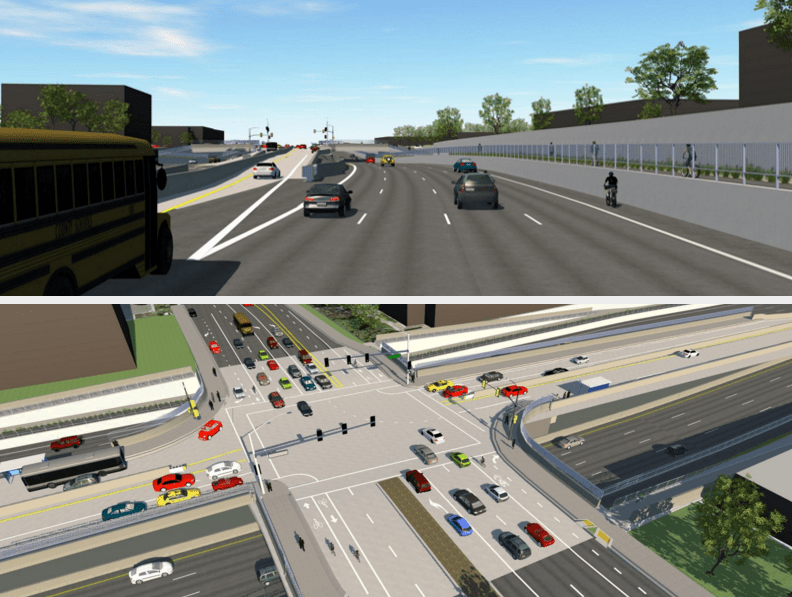 What’s with the insane amount of on-street bike lanes in inappropriate contexts in these renderings? The Lawrence expressway is actually a bike route, which is utterly insane! I was horrified when Google maps tried to tell me to turn onto it when I was trying to bike my way back to Diridon station. Who in their right mind would ever think that it’s okay to bike on a freeway breakdown lane with cars and trucks travelling at 70mph a few feet away? It’s an example of why so few people use bicycles to get around; so much of our bone-headed bicycle infrastructure was designed by highway engineers that never rode on a bicycle and never once looked at the bike routes they were designing. Looks like they are trying to make sure Lawrence remains the premiere traffic sewer of the South Bay. There should be a lawsuit against the city for proposed this sort of anachronistic, unprotected bicycle infrastructure on such a dangerous road. It’s an utter joke that they really think they are ever going to get serious numbers of people out of their cars and onto their bicycles if the continue to make driving more convenient and bicycling more dangerous (and, of course, inconvenient). looking at the image again I think Lawrence is actually the depressed road beneath the road with the bike lanes. There are too few lanes on that road to be Lawrence. That said, I completely agree with you. I grew up in this area and rode my bike around for transportation. Thinking back I must have been f*cking crazy. Expect the local Caltrans office to not be extremely helpful in this regard, especially if it isn’t an official state highway. Bike lanes are generally considered acceptable alternatives. It appears that in the top picture, they’re proposing that the shoulder be a designated biking facility on an 8-lane expressway. Obviously a massive issue. However, it appears that they’re also planning to have another bike path on top of the wall lining the trench. That in itself is good, but lack of really considering bikes viable transportation is leading to the horrifically botched design in the lower panel. Instead of designing the intersections properly, i.e. making the bikeway part of the underpass and perhaps just providing an exit ramp to the street level, they’re bringing the bikeway to the cross street and using a bidirectional cycletrack to connect the path via the intersection in the center. Needless to say, that is a completely senseless design that will result in issues that could be avoided by just designing the path properly with the grade separation. If they insist on going forward with this project, it’s imperative that advocates demand the proper design be built because the alternative is outrageous and having to rely on funding later to fix an avoidable snafu unacceptable. Well, I’d prefer to have the option, anyway, since sometimes I want to bike long distances and freeways are sometimes the only realistic route between two cities. I was also skeptical about biking on expressways until I tried it. It turns out to work pretty well for distances over a mile or so due to infrequent stops. To turn at a depressed intersection you have to maneuver into the left lane to exit. That would be really challenging on a bike. Surely the designers of this structure have taken that into account. Maybe the pathway at the top of the trench runs on both sides and accommodates exiting bicyclists. In any case this kind of expansion is short sighted. These projects are very expensive and will only buy a little time until we’re back at LOS-F. A cheaper and more sustainable alternative would be to run BRT from Westgate up Lawrence to Caltrain and then into the industrial zone. Commuters stuck in jammed traffic will see the bus whizz by and see that there’s a faster way to get to work. Wouldn’t you rather have a proper bike path parallel to the road? I don’t think Santa Clara County had a proper transit study for over 15 years. The 2000 Measure A, which was all transit, didn’t have that kind of study. If the planners at VTA focus on developing transit improvements (not just planning the same projects as outlined in 2000 Measure A) like they’ve done for the expressways and freeways, may be we would’ve a more progressive plan. The proposed tax only means more money for highways and for the list of transit projects in the 2000 tax. There’s nothing new proposed for transit, even through transit technology and planning has changed over the last 15 years. County expressways has become proactive when looking at bike and pedestrian accommodation. Their new plans all consider bike and ped access along the route. Currently I use Lawrence when I want to get to the Lawrence Caltrain in a hurry. It is sketchy (especially at the exit lane to El Camino), but there is an emergency lane available for bikes the whole way. That is better than the occasionally disappearing bike lane on Homestead in Santa Clara. I’m sure the infrequent stops make biking on Lawrence expressway great. But 70 mph vehicle traffic passing within a few feet with no barrier would qualify biking there as a stunt if a commercial film was being made. Drivers swerve into the pullover lane all the time, as is evident by all the skid marks you seen there. If you happen to be biking there when a driver makes one of the skid marks, not only will you not survive, but your funeral will probably have to be closed casket! I call shenanigans. I work near Lawrence, cross over it all the time. Traffic generally goes around 10 MPH on Lawrence, courtesy congestion. Really though Lawrence is quite sketchy, mostly due to the underpasses and strangely designed on/offramps. I do however use Central Expressway and San Tomas all the time and I like it. It looks like there’ll be a ground-level path on the edge of the depressed section, so I don’t think they’re expecting anyone to actually merge across four lanes of freeway speed traffic. Considering that bikes can legally be banned from expressways in CA, they probably should proactively take that step, but if and only if they design the path on the edge to a much higher standard than is shown in the pictures. Otherwise, forget it. 1) Calling traffic “induced demand” is a bigoted reference to the simple need for more roads in the South Bay. Perhaps if Caltrans hadn’t spent $7 billion to build a bridge with zero/nada/zip capacity above the bridge built in the 1930’s, there would be money for San Jose to have state roads with the necessary capacity. 2) The BART extension to Berryessa is dependent on BART-Warm Springs (Alameda County) getting finished. Warm Springs is hugely late. If BART hadn’t broken-the-bank on the worst piece of transportation infrastructure in history (the San Bruno – SFO – Millbrae wye), maybe there would be more confidence in public transit not being a dumping ground for idiots with money collected at the point of a gun. Yes, it’s OK, if there’s not another way. Unfortunately, here in California, there are few back roads that connect regions. And for what it’s worth, I would rather bike on the freeway shoulder than travel some of the convoluted “bike routes” that parallel them, such as 101 through Marin or the mess of stroads that comprise the I-80 bikeway through Contra Costa County. A separated facility (if direct) would absolutely be preferred, but unless you’re going to build that, don’t take away all the other options. It’s really unbelievable that the leaders of San Jose continue to totally neglect Caltrain. Caltrain and all railroads are an incredible resource that can be used for a puny fraction of the cost of building new rail lines like light rail or BART. -Tamien Station gets pathetic service–no trains for 5 hours in the middle of the day, nor any on weekends–making it impossible for most people to use. -South of Tamien, there are hundreds of thousands of people living in south and southeastern SJ, yet the two existing stations have virtually no service. -All southbound trains from Santa Clara to Tamien are restricted to a snail’s pace. College Park has virtually no service. How is this the reality in the self-designated “capital of Silicon Valley”?? “Induced Demand” is better known as population growth. Unless you want to kick people out, you are going to have it. The main problem with roads is how they are used. Prices are too low and people end up driving in single occupancy vehicles which is obviously a waste of space. Greater space inefficiency per person means more traffic. Walking is the most space efficient mode for the logical reason that.. well, we only take up as much space as our physical bodies (and you can’t really shrink people). However, it comes at the disadvantage of slow travel and therefore only specialization for short travel distances. Small single person vehicles that take up only slightly more space than a person’s body like a bicycle or scooter are a tradeoff of space vs optimization for longer travel distances. A single occupancy car is obviously more space inefficient for these distances. For the longest distances, what makes sense is public transportation. Big vehicles where the space is vertical (which means better use of road/ground space) and crowding, basically. If you just think about it.. a bus is a better use of space than a car when they are both full because of the vertical thing – you sit on top of the motor instead of side-by-side it, brake distances which scale based on speed but more importantly here the number of vehicles, crowding, which is a better use of space for obvious reasons, and also parking space. Lastly, direct frequent transit works when people walk to the stop which reduces vehicle miles traveled somewhat. But anyway, you can do the spatial density math for a bus versus a car, you know. A bendy bus that can carry 100 people is 60 feet long. so a ratio of 5:4 of people to horizontal space. The lane-width space is essentially the same since in a country with painted lanes we don’t move closer together in that direction when traffic comes up. I’ll say an average car takes up 12 feet in length, which is generous. And let’s say each car can carry 5 people. That gives a spatial utilization of 5:12 for people to horizontal space. The bus is more than three times as space efficient right off the bat! And when you think about parking space, and focusing first on reducing single occupancy car use, then traffic will be reduced. I am in favor of using our roads efficiently before we waste money on unnecessary expansion. If you don’t, then expansion just perpetuates traffic.